Frequently asked questions about Fabritecture, fabric structures and what we have to offer. Fabritecture deliver the highest quality fabric structures. We are a leading specialist contractor for bespoke fabric architecture and modular fabric structures. You will not find a specialist tensile fabric structure company who is more safety conscious, working across so many applications using a myriad of different materials. We have offices in 6 countries & have delivered over 300 projects in the past 15 years, covering over 200,000m2. Our projects have won over 40 national & international industry awards for excellence. Every project is assigned a dedicated in-house project management team to ensure your project is delivered on time and on budget, adhering to the most stringent safety standards. We are 100% committed to safety, productivity, innovation, quality, and risk management through every stage of our project delivery. From design development through to project completion, our processes are surpassed by none. 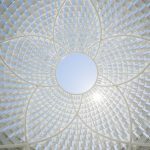 What is the difference between ‘Fabric Architecture’ and ‘Fabric Structures’? Fabric Architecture projects are our bespoke (custom) tensile fabric structure projects. Each of our Fabric Architecture projects is uniquely designed and installed by our Fabritecture team — a one of a kind. Our ‘Special Projects’ also fall under the Fabric Architecture category and refer to structures that combine steel & other forms of cladding like aluminium cladding, louvres and glass where builders & architects struggle to find contractors to complete the works. This is one of the reasons we are truly a speciality contractor. Fabric Structure projects refer to our modular and product-based range of structures. 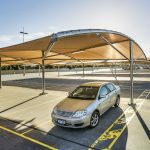 These include our TFS, Supa-Span, Alu-Hall, and Rapid-Span range of products which are utilised for various applications, including car park shade structures, remediation, storage/warehousing, aviation hangars, and sport halls. What scope of works does Fabritecture offer? Fabritecture is a specialist contractor for the design, engineering, supply, fabrication, and installation of custom tensioned membrane and ETFE clad roofing/canopies/facades, and special projects that combine steel and other forms of cladding (aluminium, glass). Who installs your fabric structures? Is your installation crew in-house or contracted externally? We have specially trained Project Managers, Site Managers, and Construction Managers who are all Fabritecture employees and who are involved with each project from inception through to completion. We also have a team of up to 50 specialist riggers who have been trained in Fabritecture’s installation and safety methodologies. Our clients often remark that our on-site construction team is what sets Fabritecture apart from the competition. Do you include engineering in your budgeted quotes? Yes. Unless engineering has already been completed under a separate contract, we always quote design and engineering of our design and construct Fabric Architecture projects. For our modular Fabric Structure buildings, a project specific engineering check is included in our pricing. We have many consulting engineers of many different disciplines that allows us to select the right engineering team for your requirements. When you combine our expertise with theirs, you have years of experience to provide the ultimate solution to your project requirements. Where do you install fabric structures? 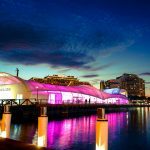 We have installed fabric structures all around the world in Australia, New Zealand, South East Asia (Papua New Guinea, Hong Kong, Singapore, Vietnam, Indonesia), the Middle East, the United States, Canada, and Europe. I need a shade sail for my house. Can you help? Unfortunately, we do not typically quote on residential projects of a small scale – only complicated or complex larger scale residential projects. How long has Fabritecture been operating for? Fabritecture has been operating in Australia since 2000. How many projects has Fabritecture delivered? Fabritecture has completed over 200 installations in the last 15 years. Who will I be working with for the duration of a project with Fabritecture? As well as dealing with the Director/Owners of Fabritecture, every Fabritecture project is assigned a dedicated Project Manager and Project Administrator. Your whole project is overseen by the Operations Manager, and supported by the Construction Manager, Construction Coordinator and, of course, the site installation team. What type of materials does Fabritecture work with? We also offer cable net and cable-supported fabric structure solutions. In addition to structures clad with tensile fabrics, we also work with other specialist cladding including aluminium, glass, and steel. What is the average lifespan of a fabric structure? Design life of a fabric structure depends largely on the fabric selection and maintenance of the structure. PVC (polyester coated vinyl) for instance has a design life from 15-25 years. PTFE has a similar longevity of 20-30 years. ETFE has an expected design life of 35-50 years. Steel framework, cables, and other elements of the project last 30+ years. Do you offer maintenance advice or contracts for fabric structures? Like with any traditional building, fabric structures require maintenance. The frequency of maintenance depends on the environment in which the fabric structure is installed, and the fabric selected for the project. 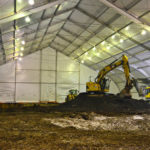 For instance, for a project in an airport or rail environment, which can produce a lot of dirt, the structure may require more frequent cleaning/maintenance as opposed to a fabric structure in a lower dirt environment. 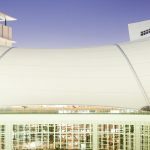 ETFE project installations require annual maintenance where the system is a pneumatic (air-supported) cushion structure; the air supply system filters need changing annually and overall system needs to be checked. Suggested maintenance regimes will be included in Contract Conditions for all Fabritecture projects. Please note that if the recommended maintenance schedules are not followed, then warranties may be voided. What is the fire rating of tensile fabric? This depends on the type of fabric used. We only use materials that have fire certification and that have been approved for use by the Building Surveyor of each project. PVC, PTFE, and ETFE have all been tested to the relevant Australian codes (AS 1530 Parts 2 and 3 and part 1 testing is currently underway). Fire certificates for various fabrics are available upon request. What types of environments/terrain can fabric structures be built in/on? We custom design and engineer our fabric structures to suit the particular conditions of each individual project. The appropriate frame and fabrics are carefully selected to suit the environmental requirements of each project. 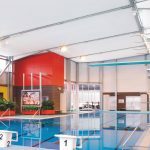 Fabritecture fabric structures can be designed to withstand any conditions from coastal cyclonic regions to desert regions, and to withstand harsh chemical environments such as remediation and aquatic enclosures. How do I go about organising a walk-through of one of your fabric structures? Contact us and we can let you know the completed structures located closest to you. We can also arrange a tour of our structures in a locality. I need to repair damage to an existing structure. Can you help? Absolutely. Head to our contact page and give us a call or send us an email, and a Project Manager will be available to assist immediately with your needs. What colours can be used for fabric structures? PVC comes in a range of standard colours, and custom colours are available. PVC can also be printed. ETFE can be printed with a variety of standard and custom colours frit patterns. PTFE is typically just white. What kind of weather can your architectural structures withhold? Both our architectural and fabric structures can be engineered to withstand any weather conditions, from Region A through to Region D (cyclonic) wind regions. We design according to the location anywhere in the world but always within the engineering standards and codes applicable to those areas. Can fabric cladding be replaced with steel, metal or glass cladding and vice versa? Fabric cladding is typically significantly lighter weight and imposes lower loads than steel, metal, or glass. This makes the supporting structural steel framework lighter. Therefore, existing steel framework which has supported steel, metal, or glass cladding can typically be used to support fabric cladding. However, the reverse would usually not be possible. If you have an existing structure that has cladding that needs replacement, contact us and we can assess options for cladding replacement. Why would I choose a fabric structure over a traditional building? Fabric structures are typically lighter weight than structures clad with rigid materials. Tensile fabric can cover longer spans without structural support compared to rigid construction (see the ITE College West project). ETFE for instance can span about three times the distance of traditional glazed panels (such as the Barangaroo South ETFE Canopy). Fabric’s natural ductility allows it to absorb movement, so they are a better choice for areas with seismic activity. They are typically less expensive, due to the lower weight structural steel required to support it. Fabric structures are quicker and easier to install, so if a project’s programme is tight, fabric is the way to go. 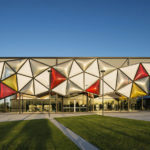 The use of fabric gives designers more freedom to create aesthetic forms and different geometries (see Oran Park Library). 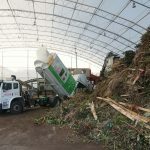 Fabric has a level of translucency that allows light transmission which can reduce daytime lighting costs on an enclosed structure (such as the Sydney Industrial Composting structure). Fabric also provides solar shading. 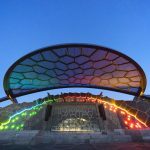 The use of LED lighting effects can be quite dramatic when displayed on fabric structures, especially ETFE (see Dockside Pavilion). Fabric structures are often selected over hard roofed structures where public safety is an issue (for instance, in government (consular) buildings where blasts are a potential occurrence). Using ETFE instead of glass is a safer option where patrons underneath as there is no issue of hard materials falling below (such as the Jakarta ETFE Canopy). Do you have a pricing sheet for your modular structures? Since each structure is specifically designed to the unique requirements of the client and their project, we cannot offer a standardised pricing sheet. Please contact us and one of our friendly staff will be able to offer you an accurate price. How long does it take to install a fabric structure? Installation of a fabric structure is typically quicker and easier than traditional construction. The time frame depends on the size of the structure and the site/access conditions. When we provide a quotation, we typically provide an estimated installation time frame. Can your structures be relocated? 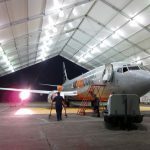 Our Fabric Structures, particularly our Supa-Span and TFS range of structures, which can be for permanent or temporary applications, have been designed and engineered to be rapidly installed and deconstructed, with ease of transportation and relocation in mind. Our bespoke Fabric Architecture projects can be dismantled if required but are typically for more permanent applications. Is there a maximum span for a fabric structure? We have designed fabric structures to span (without column support) up to 100m wide (such as the Bakersfield Convention Centre). There is no limit on the length of a fabric structure. Can your fabric structures be used for fully enclosed applications (e.g. for a remediation project or an indoor aquatic centre)? Yes. We can design our fabric structures to meet internal environment performance requirements such as U values (thermal performance) and G values (shade co-efficient). We design insulated structures to support HVAC requirements or to manage acoustics (as shown in our Macquarie University Lotus Theatre and Luna Park projects). Also, our structures can be negatively pressurised for odour control in remediation environments for instance. You can also insulate your structure or install systems to control the internal temperature of a fabric structure, such as ventilation, heating and air-conditioning units. 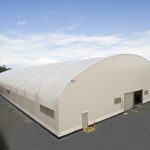 What type of warranty comes with your fabric structures? What’s included in the warranty? Fabritecture warrants its workmanship as free from defects for 12 months after completion. Fabric warranties are manufacturer-specific and range from 10 up to 25 years depending on the fabric. The framework comes with a 10 to 15 year warranty. Do you have options to customise your modular structures? Yes, all of our Fabric Structures are customisable. We can customise the frame design, and there are various accessory options that can be added, including custom doors (fabric or hard doors), ventilation systems, hoods, lighting etc. Are fabric structures environmentally friendly? Yes, absolutely. This is a large reason why tensile fabric structures are being increasingly selected over hard roofed products. PVC is completely recyclable at the end of its service life using composite fabric recycling processes, such as Serge Ferrari’s Texyloop process. ETFE is also fully recyclable. Since tensile fabric structures are lightweight, they make a minimal carbon footprint because of the minimal energy used in transportation and also installation of these structures. Overall, tensile fabric structures make a significant contribution to green construction. Our high end fabrics are typically inert materials, meaning they have incredible life expectancy and durability of more than 40 years. How can I prevent corrosion of the structural framing of a fabric structure? We always design our structures to suit the environmental requirements of every project. When fabric structures are installed in a corrosive environment, such as aquatic enclosures or for a soil remediation project where there are corrosive chemicals being extracted, there are a number of considerations which will determine the design of the structure. If it is a temporary application, for instance a short-term remediation project, there is no need to protect the steel framework or fabric. The fabric will need to be disposed of and will not be able to be reused, but the steel can be cleaned and reused in another application/installation (see our Sydney Remediation project). 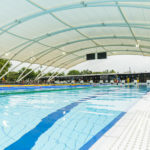 Where the project is for a long-term/permanent installation, such as a fully enclosed aquatic centre, we would look at the use of fabric liners to protect the steel work from corrosion over time (similar to Canberra Olympic Pool). Our framing systems are coated to suit the application and project requirements when using structural steel. We also offer stainless steel framing or aluminium framing. Can fabric structures be cut? What happens if they are? Usually our fabric structures are installed at heights that prevent any kind of vandalism. When the structure is an enclosure, hard walls are an option (such as the Waitakere Netball project). If the fabric structure is penetrated, minor cuts can be patched, or panels can be replaced. 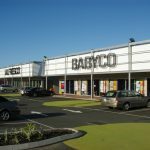 Do you deliver small-scale fabric structure solutions? Fabritecture specialises in mid-to-large scale and intricate fabric structure projects for commercial applications. At times, we have completed smaller sized ‘Special Projects’ that are architectural and extremely complex. Can your fabric structures withstand snow and wind loads? Every structure we design satisfies the relevant codes or snow, wind, and seismic loading. During engineering, we also take into account location, height, and surrounding buildings as well as the use of the structure. It is important to be aware that some companies have been known to offer shade structures that are lower in cost but not properly engineered for the application or design life required. Fabritecture engineers each and every structure to the correct standards. Where can I purchase one of your fabric structures? The process begins by contacting our Sales Team to discuss your project requirements. We then prepare a quotation for you. Please call our Sales Team on +61 7 5587 7000 or send an email to info@fabritecture.com to start the process today! How are your fabric structures transported? Every project is unique in its transportation requirements. Factors like location, fabrication and whether it will be transported by ship or air freight all make a difference. All our fabrics and steel work are protected prior to shipping from fabrication to ensure that they arrive to site in perfect condition for installation. 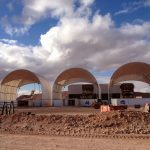 Why did I receive a response from Fabritecture when I originally contacted Global Fabric Structures? Fabritecture is a wholly owned subsidiary of the Alexander Pacific Group (APG). APG also owns Allsite Structure Rentals, Global Fabric Structures, and Precise Procurement Services Hong Kong, which are business units that provide related fabric structure products & services around the world. Who certifies your fabric structures? We have highly experienced and qualified consulting engineers who certify every one of our installations. Can fabric structures be attached to an existing building? 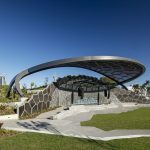 Yes, we can design our structures to be standalone (such as Capital Square) or attached to existing infrastructure (such as the Waitakere Netball project). What is typically included in the cost of a fabric structure? We issue a unique quotation for every project enquiry. The scope of work covered in our quotation depends on the requirements for the particular project. Typically, our quotation will include design, engineering, project management, steel supply and fabrication, fabric supply and fabrication, installation, site equipment, shipping and transportation. A separate quotation can be issued for service and maintenance of the structure once installed. If you have any further questions, please don’t hesistate to contact us.